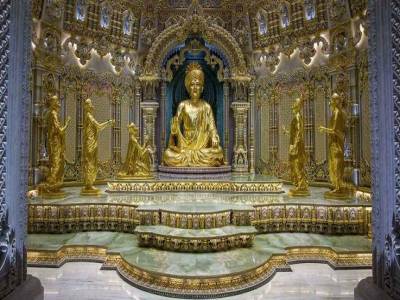 The Akshardham temple at Gandhinagar of Gujarat is a very interesting monument and religious shrine but also a very intriguing work of art. It was built with pink sandstone, brought all the way from Rajasthan in 1992 and constructed in accordance with Vedic instructions and hence abstains from employing any steel or iron beams for laying a rigid foundation to the temple structure. Instead it is supported by 20 feet tall and weighing over several thousand tons, two full stone beams which are used for a strong foundation for the temple complex. The temple shrine is the epicentre of the Swami Narayan Complex and has several other structures and operational functionalities built around it as a supplement to religious and devotional activities encouraged at the shrine. 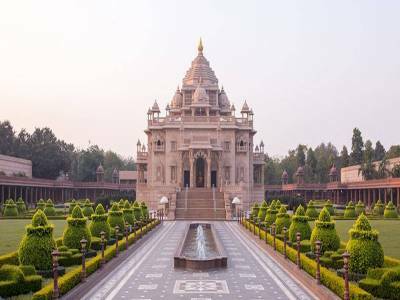 Apart from the temple, the complex also houses massive exhibition halls for mass discourses and audio visual presentations of references from popular mythological stories and religious Hindu texts. The conference halls are at least 5 in number and boast of an audience capacity of over half a lakh people. The Sat Chit Anand Water show is also a major attraction which is a light and sound interpretation of parables from various religious doctrines and texts known as Upanishads. 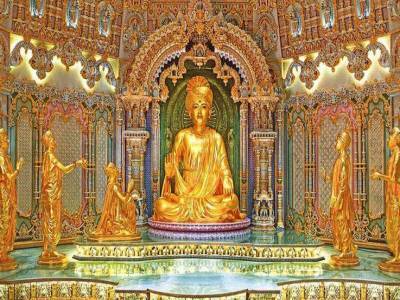 Sat Chit Anand literally translates to Knowledge Truth Bliss and is the Hindu appellation for Akshardham, or the state of continuous bliss in the knowledge of the absolute truth. The temple complex is surrounded by diverse and thickly vegetated protected garden that also sports various artistic relief structures and various art works with references to the Hindu religion. 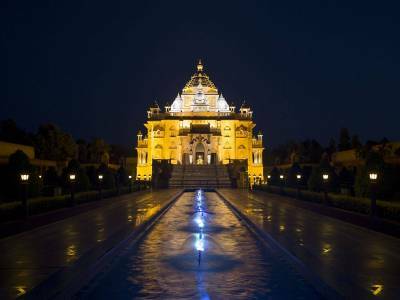 It also has major depictions in the form of structures referencing major events in the transcending life of Swaminarayan. 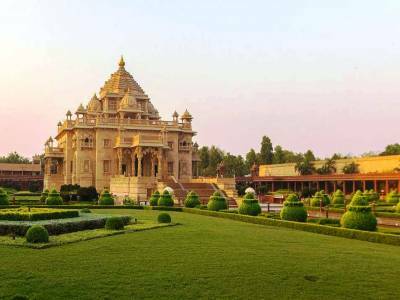 Get quick answers from travelers who visit to Akshardham Temple, Gandhinagar.